Oil and natural gas drilling companies are required to follow regulations from several different entities, including the Environmental Protection Agency (EPA) and state-level environmental agencies. 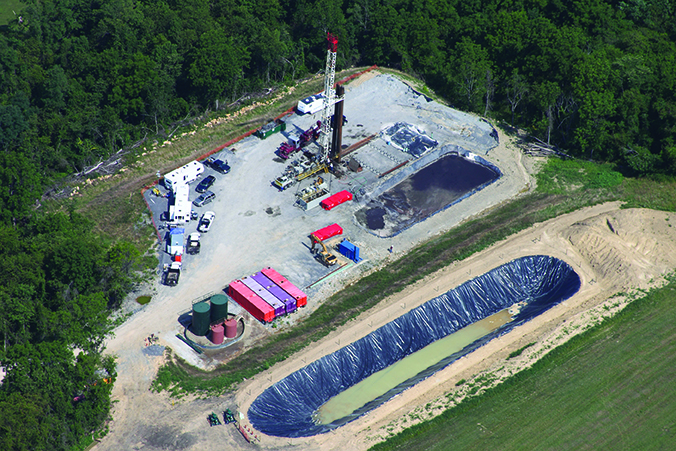 Of particular concern is the possible contamination from spilled or released bentonite clay contained in most drilling fluids. Bentonite is a generic name describing the various clays formed from the weathering of volcanic ash, but it is mostly composed of the mineral montmorillonite, which is often included in drilling fluids (and other products) to cool and lubricate the drill bit. Montmorillonite is a swelling clay that can absorb water into its crystal structure. RJ Lee Group provides bentonite testing for the oil and gas industries to help companies avoid potential issues that could result from bentonite spills. Although bentonite is nontoxic, it can adversely affect wildlife and water wells. Environmental agencies monitor drilling activities according to their permitting regulations, to ensure that drilling fluid is not being spilled or discharged into surrounding lakes and other water sources. If a spill is detected, construction must be halted, costing the drilling company tens or even hundreds of thousand dollars in clean-up, remediation, and possible fines. RJ Lee Group is one of the only laboratories in the United States that performs bentonite identification analysis. Our experts use x-ray diffraction (XRD) based on the United States Geological Services (USGS) Clay Phase ID Flow Diagram to ascertain whether bentonite is present. During the process, certain minerals behave in predictable ways, but our four-step process indicates not only if the sample contains montmorillonite, but also can identify all clays present in the sample. A bulk XRD analysis is performed last for more information. Regular sampling and analysis of soil and water around a drilling site will quickly alert oil and gas drilling companies to a possible bentonite spill, allowing for quick containment and remediation, plus avoiding potentially costly fines and work. Contact RJ Lee Group today for more information on bentonite testing by calling 1-800-860-1775, or click below and we will contact you shortly. To view our Bentonite handout, please click here.